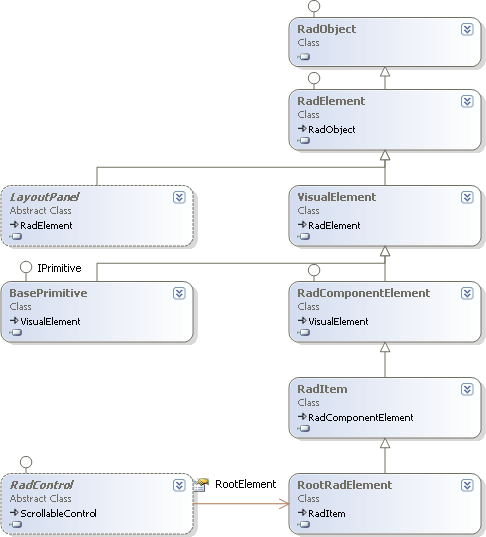 The diagram below contains an abbreviated class diagram of the class inheritance starting with RadObject and building up to RadControl. RadProperty and RadPropertyMetaData are not shown. RadProperty encapsulates properties used in RadObject and support dependency properties. Each RadProperty has a name, type, owner and metadata, i.e. information about the property. RadPropertyMetadata describes a property and separates the information about a property from the property itself. RadObject represents the base class for all RadElement objects and has the ability to store all property values in a single structure. RadElement is a key class that represents the smallest unit in a RadControl that can be painted or laid out on the screen. RadElement is the base class of all elements that take advantage of TPF features, e.g. property inheritance, layouts and styling. RadElement implements a tree-like structure of RadObjects, property value inheritance and automatic layout and display invalidation based on the options of the PropertyMetadata for each RadProperty. RadElement has a size and location specified in coordinates in relation to its parent. LayoutPanel an abstract class descending from RadElement. LayoutPanel descendants coordinate sizing and position for a number of elements. RadComponentElement implements IComponent and introduces the ability to be contained. BasePrimitive is a VisualElement descendant that adds a virtual PaintPrimitive() method that draws a primitive to the screen. RadItem represents a visual element which could be added to an ItemsCollection and can be selected, deleted or moved during Visual Studio at design time. By default this class knows how to handle user input.RadControl is the abstract base class for all RadControls. Each RadControl contains a tree of RadElements. The tree has a root, the RadControl.RootElement (type RootRadElement shown in the diagram) and children of the root element. RadControl acts as a bridge between the traditional Windows forms controls and the RadElement tree. RadControl also defines properties common across all controls e.g. ThemeName, Style, ImageList, image scaling properties, minimum and maximum sizes.